I know, I know. The insinuation that M&S have just invented the concept of donating unwanted clothing rather than throwing it in the bin is pretty grating. PARTICULARLY as M&S are, in my opinion, a clothing retailer guilty of sacrificing their long established association with excellent quality products in the 'race to the bottom', producing and selling an increased quantity of poorer quality items selling at a lower price and rebranding themselves (pretty successfully) as a 'fashion' destination. 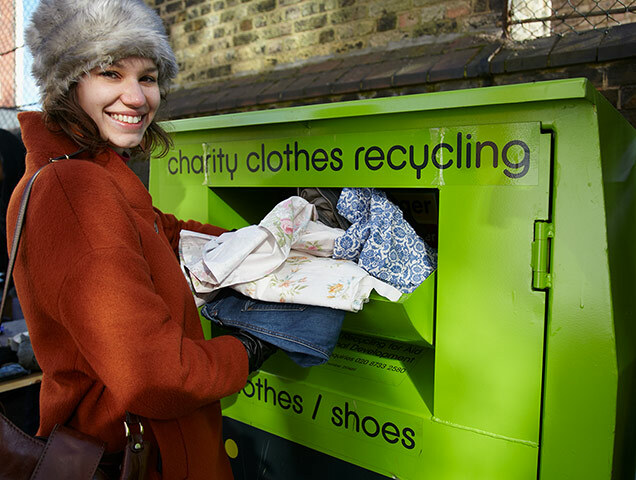 I find it infuriating and frustrating that whilst they are in part responsible for the sea of cheap, unloved and under-valued clothing currently flooding British wardrobes, they are offering the public the 'revolutionary' action of introducing clothing donation banks into their stores (no doubt for a limited period) to try and mop up some of this spillage of unwanted clothes. It's a bit like turning up to Pompei, post-eruption, with a dust pan and brush (but also having in part caused the disaster). However, if their clothing banks and advertising campaign do manage to reach some people who are currently unfamilar with charity shops and clothing/textile donation banks and the fact that garments can be of use after they no longer want them, then actually get those people donating rathering than binning, then of course it will have been a valueable project. But I am irritated somewhat by the lack of information given about the onward journey of those donated garments, which is surely a key part of the message that should be included in this advert. And also the assumption that, by donating their unwanted items, that the public are then encouraged to turn around and buy more M&S clothing whilst they happen to be in the store. More clothing that will no doubt end up unwearable or unwanted equally quickly as the items just donated. I think that is what annoys me the most about the M&S TV advert, that the real issues and complexities of huge quantities of unwanted textiles either languishing in cupboards or ending up in landfill aren't in any way being adequately being addressed when the rabid consumption of cheap and poor quality items is in no way being discouraged. Basically the crux of the Guardian piece I initially started this post to talk about is this: the concept of donating and reusing unwanted clothing, accessories and textiles is not a recent invention conjoured up by Marks & Spencer's marketing eggheads. It has been happening, usually with very little fanfare, for decades, and one of those companies that has been doing so is the charity I work for: TRAID. The photos included in the Guardian piece trace the journey taken by some of the textiles the charity processes. 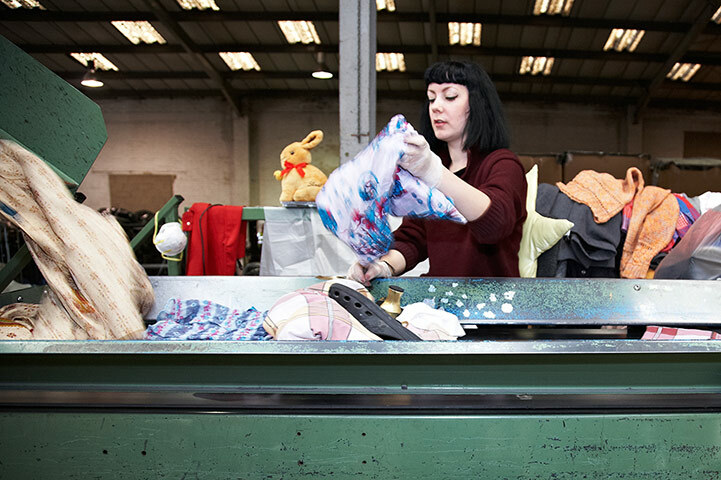 I think it's important for people to get a chance to see more of what happens after an item of clothing has been donated into one of TRAID's textile banks (or any other clothing/textile recycling/reusing process). To get a sense of the whole food chain, of all the effort it takes and people that work hard to give each unwanted item the most sustainble future possible, maybe it would make people stop for a minute before going down the fast fashion route as often as they currently do. 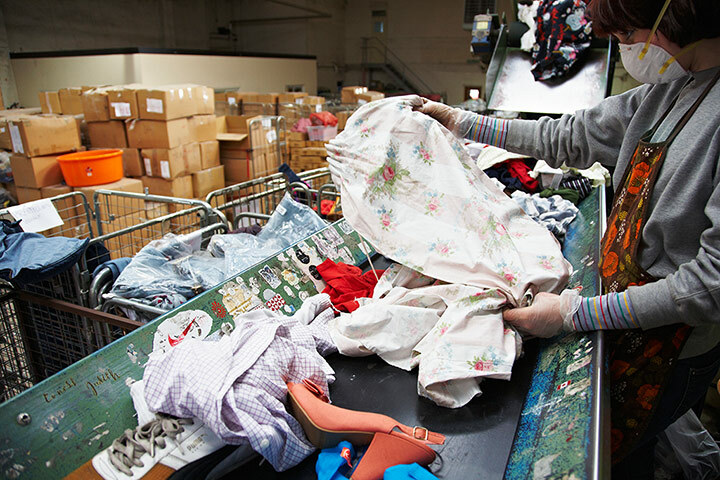 TRAID receive its textiles through both public donation via banks like the one above and from industry. Occassionally clothing manufacturers with ethical targets to meet will donate us their end of line pieces (clothing or fabric), end of rolls, samples, etc. But the majority comes from the public. All the donation banks are emptied by a team of van drivers and everything goes to the warehouse in Wembley, North London, to be processed. A couple of tough guys with protective clothing break open all the plastic bags, remove as many of the non-textile iems as possible, and send everything through a chute which leads to a conveyor belt. A gang of about eight or so sorters (often comprising of some of the TRAID charity shop managers who must go to Wembley once a week to sort stock for their shop) pick through the conveyor belt's contents. They work quickly, selecting and sorting items into catagories (different quality levels of women's wear, menswear, childrens wear, home textiles, vintage, fabric, shoes etc.) literally throwing them into large metal trolleys positioned behind the belt. The contents of those metal trolleys (pictured above) then receive some fine sorting, to check if there have been some miscatagorisation, or if there is damage not noticed previously. 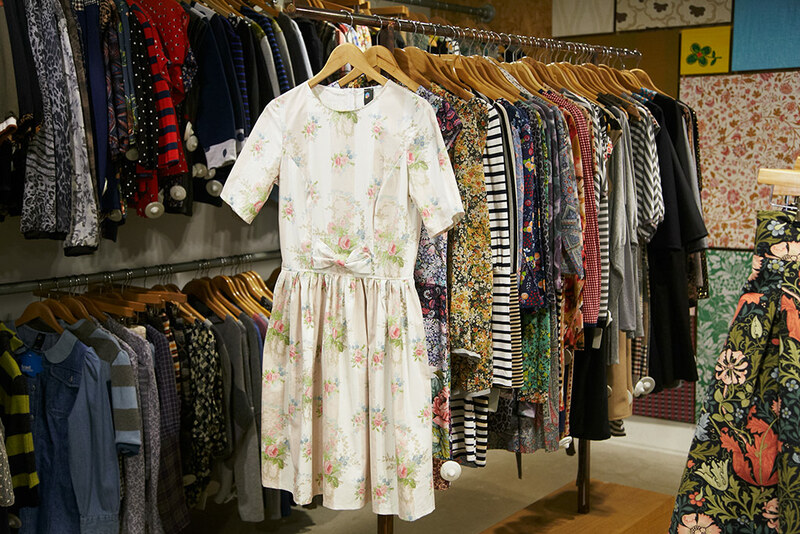 The items that can be sold in the shops get distributed appropriately, for example, the shops that are in more family-orientated locations receive homeware and children's wear, whilst the more youthful and fashiony locations like Camden receive vintage clothing, and so on. This is why the shop managers are encouraged to do some weekly sorting, because they know their shop customers best. 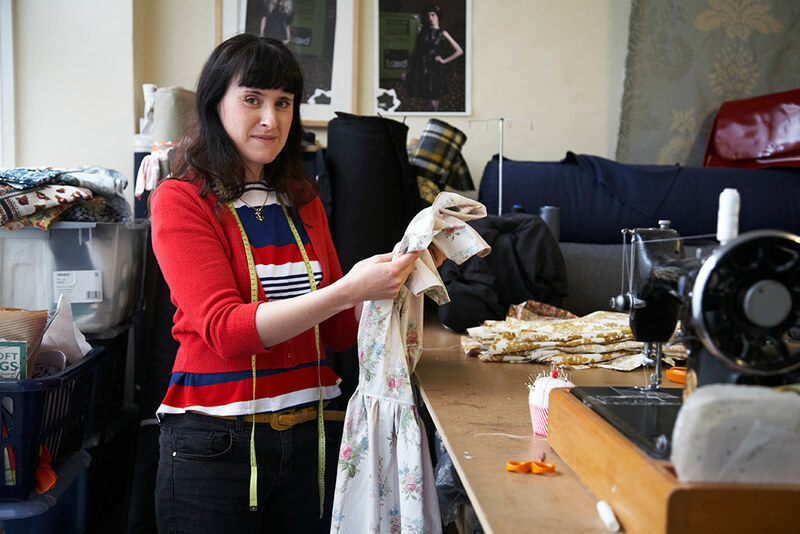 All the pieces of fabric, curtains and some un-resellable clothing gets delivered to the TRAIDremade studio in Brighton once a fortnight. We don't use everything we receive. We sort through the delivery and work out what is and isn't suitable to make into clothing. Once the fortnightly delivery has been sorted, my boss and I figure out a plan of what to make over the next couple of weeks. As I previously explained in Tilly's 'A Day in the Life' interview, we create small batches (usually between four to nine per style) of garments rather than working a piece at a time for speed. Occassionally we'll make batches of a style we have previously made, but usually we'll adapt a pattern/style we have made before, or we'll create a new style. A curtain like the one we are following, that isn't too 'curtainy' and has a nice, seasonal print and isn't stained or faded, will probably become a dress, skirt or pair of shorts. Our curtain became a dress with fitted bodice, dirndl skirt, half-sleeves and a self-bow. Currently, the TRAIDremade line can be found in the Camden, Hammersmith and Shepherds Bush shops with selected pieces also sold online. 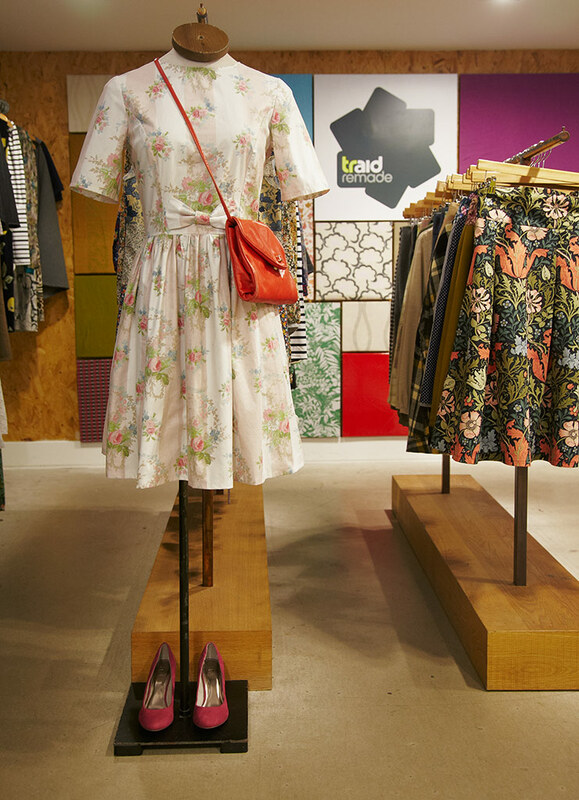 Here's our curtain-dress in the TRAIDremade section of the TRAID shop in Camden. I love what TRAID does, and it's nice to see behind the scenes. I also wonder how this 'schwopping' thing will develop or if it will fade away after the initial publicity. I would guess so, since it's not really in their interest for consumers to buy less, which would be the logical next step on from their campaign! We have a sort of giant clothing recycler in town where the public gets to paw through the materials and buy by the pound. A lot of the buyers fill semi-trucks up and ship the stuff to Central America. It's interesting to look through, but also pretty disgusting to see so much volume of clothing cast off. I really enjoy all of these types of posts you write! I worked for a fast fashion type of company years ago and their mass production of garments and lack of quality made me sick! What's even worse is how much and how often people purchase items in places like this. I don't see any end to this fast fashion business! If only there were more charities like TRAID out there in the world. I work for a charity shop in San Diego and it's nice to have a cause and know that items are being recycled but, even here you see the same consumption habits you would at a mall. I really hope people start to change this and think about what it's doing to the world. As long as I know that I am doing my part that's all I can really focus on. YOU ROCK ZOE! I would love love love working in the TRADEremade studio! Ohh, to be making new clothing from old all day long...I would imagine it's very satisfying knowing that you make a difference, even if it is a relatively small one. Every step counts, right. But I have my own big plans in the making, so hopefully I'll up my game real soon and start making bigger difference. Thanks for all the awesomeness! 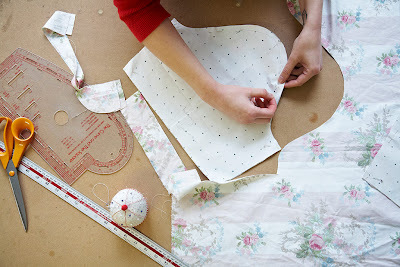 Such an interesting post - fascinating to see the journey of the curtain into a Zoe-made dress! I think the M&S campaign is really clever actually - Oxfam totally know what they're doing. They're using Joanna Lumley to appeal to a set of people who would never venture into a charity shop, but who might pop into Marks's for their groceries, encouraging them to change their behaviour. I can understand why you're annoyed, it does sound like they're saying they invented the charity shop (! ), but by using JL it sounds tongue-in-cheek, almost like it's Patsy from Ab Fab saying it. And what they're doing is subtly preaching to the unconverted, the harder to reach people who want reassurance that even Joanna Lumley recycles her unwanted cardigans! oh Zoe, I'm so happy you found this job, and so cool you're on the Guardian!! I have been buying less and less new clothes in the last year or two, with a focus on good quality (and ideally good working conditions) when I do buy something. thanks for the inspiration, you are my hero! Thank you for sharing the end to end of it all. I've always been fascinated by what you do (reworking textiles on a 'commercial' basis rather than my home basis) and where the fabric comes from! It was so weird reading this post today, as today for Me Made May I decided to wear a jumper my sister designed and knitted 20 years ago! I think fast fashion may have whizzed past me! Thanks for sharing this. It is really neat to see what you do for work, and such cool and interesting work you do! I am not aware of such a business here in the U.S. (at least were I live in the Pacific NW). Of course we have thrift shops were people can buy other peoples used stuff, but I don't think we have a place that recycles and refashions things. I wish we did, as it is a terrific idea. This is just fascinating, Zoe, I am so glad you introduced us to the whole process of your company, it's amazing. Thank you. I wish and hope this comes to the states! I enjoyed seeing behind the scenes. We tried this at the local Oxfam shop - just a few items for the window display - I thought it was very difficult - makes me appreciate what you are doing at TRAIDremade so much more. I totally agree with you on the m&s front, as soon as I saw the advert I was thinking, 'well what happens to all the donated clothes?' If they said they had teamed up with a particular charity shop or something I might be more convinced. I really loved seeing the behind the scenes of Traid too! What an interesting post- from Gaurdian to awful ad to the peek into triad. I guess if M&S gets a few more people to change their habits, that's a good thing, right? Wow, you have my dream job. Sewing all day but doing something meaningful for society at the same time. Congratulations on being featured in the Guardian! 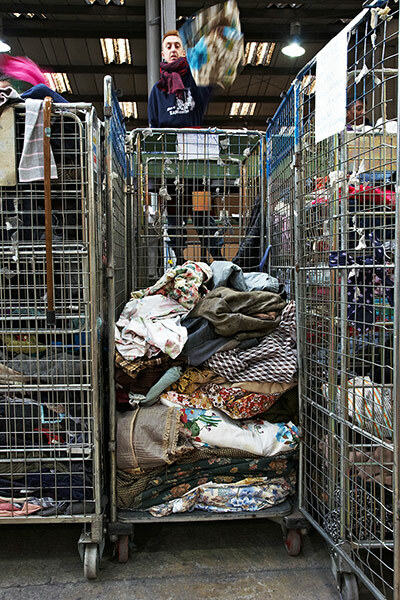 Here in Germany most people donate their unwanted clothing to recycling banks. But unfortunately they are run differently from yours. Companies rent them and sell the best clothing in second hand stores. The rest is sold in Africa for a price so low that the local textile industry can't compete with and is killed off. We only have a few charity shops and I don't really know anybody who buys there. Hopefully, this will change someday. I'm always inspired by your capacity to turn something old and dull into something cool, especially doing it so much! Wow, that is fantastic! What a fun job, too! I wonder if there's anything like that in the US? Thanks for the glimpse into TRAID! You've inspired me to see if there's a similar organization in Seattle. (I'm guessing we don't, although thrift-store shopping is pretty popular here and I've been running into more and more people in the textile aisle of the Goodwill who are gathering sheets for sewing projects!) PS you have my dream job!